Wouldn't it be wonderful to live in a world free of hate, illness, abuse and cancer? Although that might not be possible in my lifetime, or even my children's, I'd love to hope that one day it could become a reality. I honestly believe that if we all work together, we can make a difference. Save the Ta-tas has a dream as well. The dream to find the cure to end cancer and to support individuals struggling to live life regardless of having cancer. 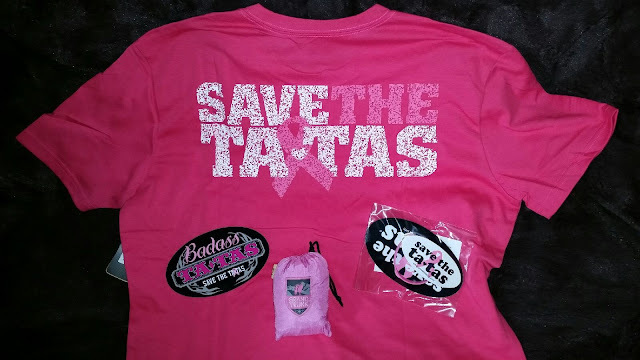 With every Save the Ta-tas item purchased, an important and life changing step is taken to accomplish great things and to spread the word of love and support. I love the fact that Save the Ta-tas is dedicated to a wonderful cause. With the purchase of every item, a portion goes to help support breast cancer research and awareness. It makes me proud to wear and flaunt my Ta-tas (clothing and accessories). 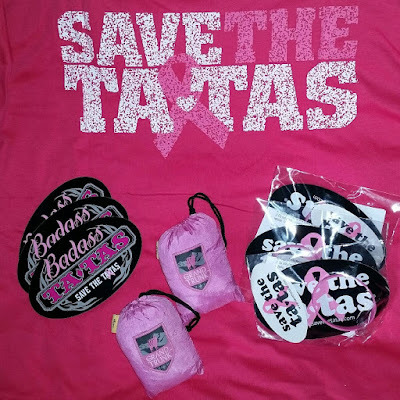 Save the Ta-tas clothing is super cute, fashionable and comfortable. Everything from shirts to bracelets to magnets to flip flops. There is also something for the entire family: men, women, children and pets included! 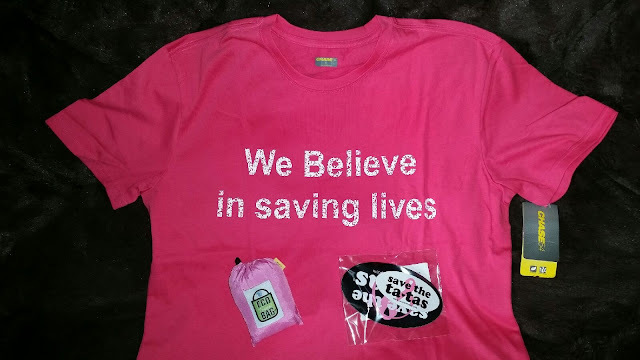 I know that breast cancer is a serious issue (I'm a breast cancer survivor), but there is just something about their shirts that make me smile! There were many times throughout my treatments and battle that my husband and I used humor to cope! A little humor and laughter can make a big difference! 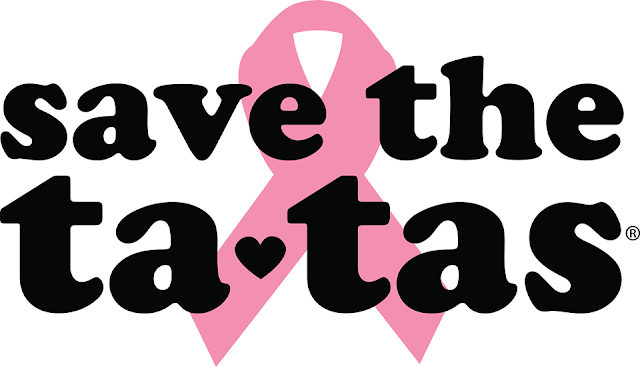 The Save the Ta-tas® Foundation and Ta-tas® Brand was created by clothing designer Julia Fikse in 2004 as a way to fight breast cancer using laughter and fun as a way to fight a serious disease. Her playful line of t-shirts and accessories and message of hope and humor have helped hundreds of thousands of victims to fight the disease with courage and joy. To date, Save the Ta-tas has donated over 1 Million Dollars to fight breast cancer! This is a phenomenal accomplishment. This giveaway will end November 15th at Midnight EST. Disclaimer: The Being Frugal and Making it Work family received complimentary Save the Ta-tas merchandise for the purpose of writing a review and hosting a giveaway. Regardless, I only recommend products or services I would use personally and/or believe will be a good fit for my readers. The views and opinions expressed on this blog are based purely by our own experiences. No monetary compensation was received. Results may vary. I would also love The Official Save the Ta-tas® LogoCoffee/Tea Mug! I can always use a new mug! I like the Pirate TaTas shirt! Too cute! Surfer Girl Tatas shirt and the Humor Heals shirt are both great as well. Thanks for hosting! My MIL is a breast cancer survivor! I like the "Surfer Girl Ta-tas" tank top! Very cute. Oops, I was five words short! The t-shirt is cute, too, but I really like the "Surfer Girl Ta-tas" tank top. I practically live in tanks all summer! I love the Save the TaTas umbrella. It is really cute and an umbrella is the perfect billboard for the cause! Get 1500 SB when you try Home Chef today! 2016 Holiday Gift Guide: Seeking Sponsors! Breast Cancer Awareness Month Round-Up! Swagenger Haunt: 5 days, 10 Winners of 500 SB!